2004-2007: Doctoral fellowship from German Research Foundation (DFG/SFB) in the research centre of mechanism of inter-specific interaction of organisms. Molecular oxygen is required for respiration in all aerobic organisms but oxygen levels are very low in some plant organs such as seeds, tubers and buds, where hypoxia is linked to quiescence. The release from hypoxia in these organs coincides with the transition of cells from the quiescent to the metabolically active state. In contrast, the hypoxia experienced by roots during flooding has deleterious effects on the tissues and can lead to cell death. Nitric oxide (NO), which is a powerful signalling molecule in plants and animals, is important in the release from seed dormancy and flooding tolerance but the mechanisms involved remain to be fully characterised. Our lab is currently working on to characterise the functions of NO in the adaptation to hypoxia and release from the hypoxic state, with a particular focus on the signalling functions of NO and reactive oxygen species (ROS) during the release of cells from the quiescent state in seeds and buds, and in roots subjected to flooding in the model plant species such as chickpea and tomato. Under oxygen limitation, regeneration of NAD+ for glycolysis is required for maintenance of a minimal ATP supply. 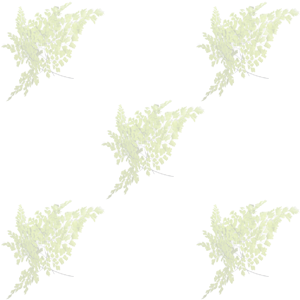 Recent studies document that plants can fine tune oxygen consumption in response to low oxygen concentrations and maintain glycolysis by switching to alternative pathways for NAD+ regeneration, including nitrate reduction. The mechanisms that underlie this sensing and response to oxygen deprivation have not been fully elucidated. It is also not clear whether plants use NO as a major regulator of bioenergetics and oxygen homeostasis as animals are known to do. At present answering these questions is very important priority of our lab in order to achieve complete understanding of low oxygen sensing mechanisms and the metabolic adaptations to oxygen deprivation in plants. Our research in this line will provide new insights into these mechanisms and the metabolic adjustments associated with controlled use of carbohydrate and ATP during hypoxic survival. The knowledge gained from this project will help to develop plants with better survival and performance in areas suffering from frequent rainstorms and flooding. Our lab in collaboration with IBERS, UK, will explore a novel method of increasing nitrogen use efficiency (NUE) in crops to help meet the food security agenda. Nitric oxide is a product of nitrogen (N) metabolism but excess of NO production may suppress N uptake thereby acting as a negative feedback mechanism. Intrinsic to this feedback mechanism is the-suppression of nonsymbiotic haemoglobin (snHb) expression which would otherwise oxidize the excess of NO to NO3. In this context we will establish how snHb expression is regulated to modulate NO accumulation and further we will explore how NO modulates N-channels and NUE. Vishwakarma A, Kumari A, Mur LAJ, Gupta KJ (2018) A discrete role for alternative oxidase under hypoxia to increase nitric oxide and drive energy production. Free Radical Biology and Medicine ,122:40-51. Gupta KJ*, Kumari A, Florez-Sarasa I, Fernie AR, Igamberdiev AU (2018) Interaction of Nitric Oxide with the Components of Plant Mitochondrial Electron Transport Chain. Journal of Experimental Botany ,69 (14),3413-3424. Berger A, Brouquisse R, Pathak P K Hichri I, Inderjit, Bhatia S, Boscari A, Igamberdiev, AU, Gupta KJ (2018) Pathways of nitric oxide metabolism and operation of phytoglobins in legume nodules: missing links and future directions Plant Cell & Environment,41(9)2057-2068. Wany A, Gupta KJ (2018) Reactive oxygen species, nitric oxide production and antioxidant gene expression during development of aerenchyma formation in wheat. Plant Signalling & behaviour,13 (2),3002-17. Pandey S, Kumari A and Gupta KJ (2017) Measurement of Respiration and Internal Oxygen in Germinating Cicer arietinum L. seeds Using Micro sensor. Methods in Molecular Biology 1670: 57-62. Pathak PK and Gupta KJ (2017) Using an Oxygen Microsensor to Measure Oxygen Dynamics in Tomato Plants in Response to Pseudomonas syringe Infection. Methods in Molecular Biology 1670: 63-69. Kumari A, Preston G, Gupta KJ (2017)Measurement of Oxygen Status in Arabidopsis Leaves Undergoing Hypersensitive Response During Pseudomonas Infection. Methods in Molecular Biology 1670: 71-76. Pandey S, Kumari A, Gupta KJ (2017)Isolation of physiologically active and intact mitochondria from chickpea. Methods in Molecular Biology 1670: 77-85. Kumari A and Gupta KJ (2017) VisiSens Technique to Measure Internal Oxygen and Respiration in Barley Roots. Methods in Molecular Biology 1670: 39-45. Horn R, Gupta KJ, Colomobo N (2014) Mitochondrion role in molecular basis of cytoplasmic male sterility. Mitochondrion 19: 198-205. Gupta KJ, Mur LAJ, Ratcliffe RG (2014) Guarding the guard cells? New Phytologist. 203: 349-351. Gupta KJ, Brotman Y., Mur L.A.J. (2014) Localisation and quantification of reactive oxygen species and nitric oxide in Arabidopsis roots in response to fungal infection. Bio Protocols (Online). Gupta KJ, Hebelstrup KH, Kruger NJ, Ratcliffe RG (2014) Nitric oxide is required for homeostasis of oxygen and reactive oxygen species in barley roots under aerobic conditions. Molecular Plant 7: 747-750. Gupta KJ, Mur L, Brotman Y. (2014) Trichoderma asperelloides suppresses nitric oxide generation elicited by Fusarium oxysporum in Arabidopsis roots. Molecular Plant-Microbe Interactions. 27: 307-314. Igamberdiev AU, Ratcliffe RG, Gupta KJ. (2014). Plant mitochondria: Source and target for nitric oxide. Mitochondrion. 19: 329-333. Gupta KJ, Brotman Y, Segu S, Zeier T, Zeier J, Persijn ST, Cristescu SM, Harren FJM, Bauwe H, Fernie A.R. (2013) The form of nitrogen nutrition affects resistance against Pseudomonas syringae pv. phaseolicola in tobacco. Journal of Experimental Botany (64): 553-568. Mur LAJ, Hebelstrup KH, Gupta KJ (2013) Striking a balance: does nitrate uptake and metabolism regulate both NO generation and scavenging? Frontiers in Plant Science 4: 288. 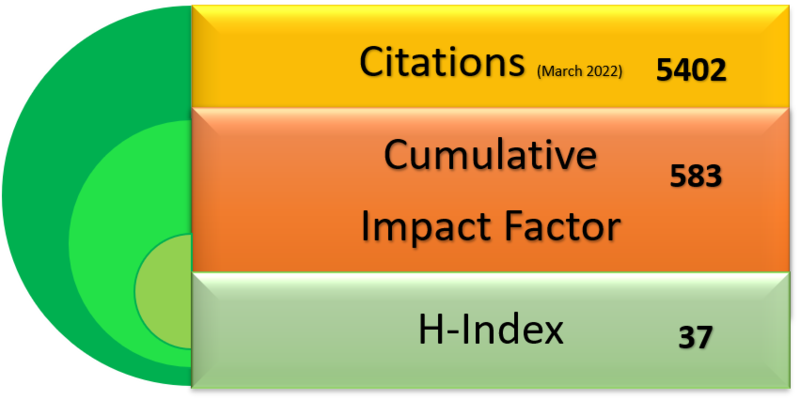 Mur LAJ, Mandon J, Persijn S, Cristescu SM, Moshkov IE, Novikova GV, Hall MA, Harren FJM, Hebelstrup KH, Gupta KJ (2013) Nitric oxide in plants: an assessment of the current state of knowledge. AoB Plants 5. Gupta KJ., Shah JK, Brotman Y, Jahnke K, Willmitzer L, Kaiser WM, Bauwe H, Igamberdiev AU (2012) Inhibition of aconitase by nitric oxide leads to induction of the alternative oxidase and to a shift of metabolism towards biosynthesis of amino acids. Journal of Experimental Botany 963: 1773-1784..
Gupta KJ, Igamberdiev AU, Mur LAJ (2012) NO and ROS homeostasis in mitochondria: a central role for alternative oxidase. New Phytologist 195: 1-3. Manjunatha G, Gupta KJ, Lokesh V, Mur LA, Neelwarne B. (2012) Nitric oxide counters ethylene effects on ripening fruits. Plant Signal Behaviour 7: 476-483. Gupta KJ, HebelstrupKH, Mur LAJ, Igamberdiev AU (2011) Plant hemoglobins: important players at the crossroads between oxygen and nitric oxide. FEBS letters 585: 3843-3849. Engel N, Ewald R, Gupta KJ, Zrenner R, Hagemann M, Bauwe H (2011) The pre sequence of Arabidopsis serine hydroxymethyltransferase SHM2 selectively prevents import into mesophyll mitochondria. Plant Physiology 157: 1711-1720. Ramirez-Aguilar SJ, Keuthe M, Rocha M, Fedyaev VV, Kramp K, Gupta KJ, Rasmusson AG, Schulze WX, van Dongen J.T. (2011). The composition of plant mitochondrial super complexes changes with oxygen availability. Journal of Biol Chem 286: 43045-43053. Gupta KJ (2011) Protein S-nitrosylation in plants: photorespiratory metabolism and NO signaling. Science Signaling 154 jc1. Gupta KJ, Fernie AR, Kaiser WM, van Dongen JT (2011) On the origins of nitric oxide. Trends in Plant Science16:160-168. Van Dongen JT, Gupta KJ, Ramírez-Aguilar SJ, Araujo WJ, Nunes-Nesi A, Fernie AR (2011) Regulation of respiration in plants: A role for alternative metabolic pathways. Journal of Plant Physiology 168:1434-1443. Gupta KJ, Hincha D.K., Mur L.A.J. (2011) NO way to treat a cold. New Phytologist. 189: 360-363..
Manjunatha G, Lokesh SV, Neelwarne B, Singh Z, Gupta KJ (2011) Nitric oxide applications for quality enhancement of horticulture produce. Horticulture reviews 42. Gupta KJ, Igamberdiev A.U. (2011) The anoxic mitochondrion as nitrite: NO reductase. Mitochondrion 11: 537-543. Gupta KJ, Igamberdiev AU, Manjunatha G, Segu S, Moran JF, Neelawarne B, Bauwe H, Kaiser WM (2011) The emerging roles of nitric oxide (NO) in plant mitochondria. Plant Science181: 520-6. Gupta KJ, Bauwe H, Mur LAJ (2011) Nitric Oxide, Nitrate Reductase and UV-B tolerance. Tree Physiology 31: 795–797. Brotman Y, Gupta KJ, Vetribo A. (2010) Trichoderma: Quick Guide. Current Biology 20: 390-391. Gupta KJ, and Kaiser WM (2010) Production and scavenging of nitric oxide by barley root mitochondria. Plant and Cell Physiology 51: 576-584. Gupta KJ, and Igamberdiev AU (2010) Kudzu invasion leads to NOx increase and ozone pollution: unravelling possible mechanisms. Proceedings of the National Academy of Sciences (USA) 107: E 153..
Gupta KJ, Igamberdiev AU, Kaiser WM,(2010) New insights into the mitochondrial nitric oxide production pathways. Plant Signalling and Behaviour. 5: 999–1001. Zabalza A, van Dongen JT, Froehlich A, Oliver S, Faix ., Gupta KJ, Schmalzlin E, Igal M, Orcaray L, Royuela M, Geigenberger P. (2009) Regulation of respiration and fermentation to control plant internal oxygen concentration. Plant Physiology 149: 1087-1098. Rumer S, Gupta KJ, Kaiser WM. (2009) Plant cells oxidize hydroxylamines to NO. Journal of Experimental Botany 60: 2065-72. Gupta KJ, Zabalza A, van Dongen JT (2009) Regulation of respiration when the oxygen availability changes. Plant Physiology 137: 383-391. Rümer S, Gupta KJ, Kaiser WM (2009) Oxidation of hydroxylamine to NO by plant cells. Plant Signalling and Behaviour 4: 853-855. Stoimenova M, Igamberdev AU, Gupta KJ, Hill R.D. (2007) Nitrite driven anaerobic ATP synthesis by barley and rice root mitochondria. Planta 226: 465-474. Planchet E, Gupta KJ, Sonoda M, Kaiser WM (2005) Nitric oxide emission from tobacco leaves and cell suspensions: rate-limiting factors and evidence for the involvement of mitochondrial electron transport. 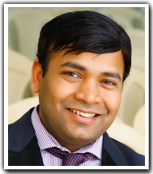 The Plant Journal 41: 732–743..
Gupta KJ, Stoimenova M, Kaiser WM (2005) In higher plants, only root mitochondria, but not leaf mitochondria reduce nitrite to NO, in vitro and in situ. Journal of Experimental Botany 56: 2601-9. Gupta KJ and Ewald R (2015) Simultaneous isolation of root and leaf mitochondria from Arabidopsis. Alternative respiratory pathways in higher plants. In: KJ Gupta, LAJ Mur, B. Neelwarne (Editors). John Wiley and Sons, Oxford. pp 359-365..
Gupta KJ, and Igamberdiev AU (2014) Compartmentalization of reactive oxygen species and nitric oxide production in plant cells – an overview. pp 1-14. Springer Verlag New York. Gupta KJ and Igamberdiev AU (2014) Reactive Oxygen and Nitrogen Species Signaling and Communication in Plants. In: Gupta K.J, Igamberdiev A.U. (Eds). Springer Verlag. New York. Mur LAJ, Gupta KJ, Chakraborty U, Chakraborty B, Hebelstrup KH. (2015) Ethylene, nitric oxide and haemoglobins in plant tolerance to flooding. Abiotic Stresses in Crop Plants, pp 43. Gupta KJ, and Rolletschek H. (2012) Plant respiratory metabolism: a special focus on the physiology of beetroot (Beta vulgaris L.) mitochondria. Red Beet Biotechnology, pp. 91-104. Springer US. Mur LAJ, Lloyed AJ, Gupta KJ, Chakraborty U, Chakraborty B (2014) Harnessing the power of metabolomics to improve crop tolerance against stress. Review of Plant Pathology. 6 (59-92) Scientific Publishers. ISBN: 978-81-7233-916-6. Kaiser WM, Gupta KJ, Planchet E. (2007) Higher plant mitochondria as source of NO. Plant Cell monographs1-11. In: L Lamattina, JC Polacco, eds, Nitric Oxide in Plant Growth Springer, Berlin. 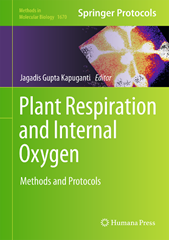 Gupta KJ (Editor) (2017): Plant Respiration and Internal oxygen: Methods & protocols: Methods in Molecular Biology, Humana Press. USA 2017. 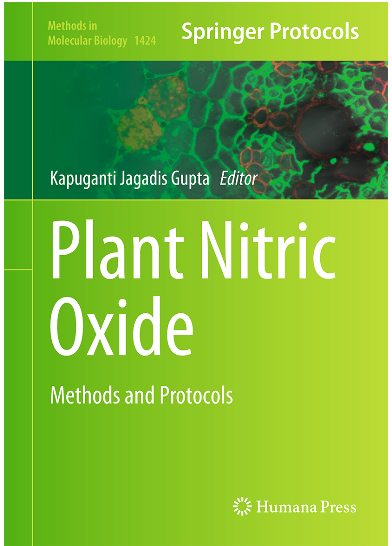 Gupta KJ (Editor) (2016): Plant nitric oxide: Methods & protocols: Methods in Molecular Biology, Humana Press. USA 2016. Gupta KJ, Igamberdiev A.U. 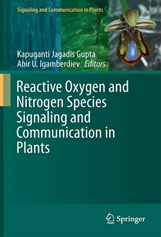 (Editors) (2015) Reactive Oxygen and Nitrogen Species Signaling and Communication in Plants. Springer, Switzerland 2015. Gupta KJ, Mur LAJ, Neelwarne B. (Editors) (2015). 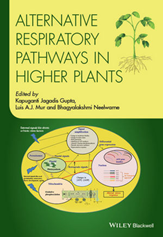 Alternative respiratory pathways in higher plants. John Wiley and Sons, Oxford 2015.